It seems like a mountain has been climbed, but from now on, the focus is on “clean work”. 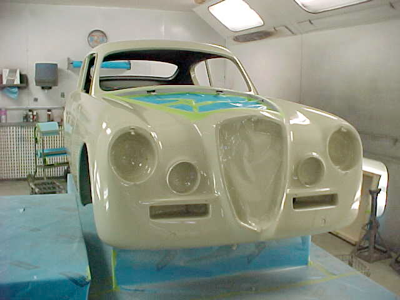 It took a lot to get into paint – seam lines checked and re-checked, details everywhere. The rear tailights were a problem. The curves in the B10 lights and the line of B20 fender simply aren’t the same. After a bit of detail adjustment on both, there is now a smooth line. The trimmer, Werner, will be here after Dec. 1. We have cloth from Hirsch and vinyl from Trinchero. Seats are blocked out. The trimmer used to be a factory trimmer for Mercedes 300’s, so he knows the period. He’s done a number of early ‘50’s Ferraris, so it should be OK. Mechanically, all is apart – some is back together. Steering box, rear shocks are reassembled. Brakes are with Tony Nicosia in California. Transmission bits came from Europe, so that should go together soon. We are awaiting one front spring, but then the front suspension will be put back together. Wiring harness is in fabrication in California. Motor is still awaiting having liners pulled. Next, off to the plater/polisher to discuss chrome color (!) and level of polishing. 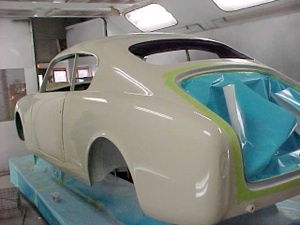 The goal is to keep the car with that 1950’s feel, and not be over-chromed.